Although snow in October is pretty unlikely, it’s always great to think ahead to the festive season. And our county really knows how to make Christmas extra-special, with a wealth of local events offering excellent shopping opportunities, as well as filling you with plenty of yuletide cheer! 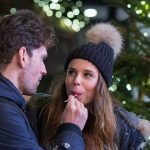 Love it or hate it, picking up perfect presents for your loved ones has to be done, so forget the high street and head to one of Norfolk’s festive markets for unique gifts that promise to put smiles on people’s faces on Christmas morning. 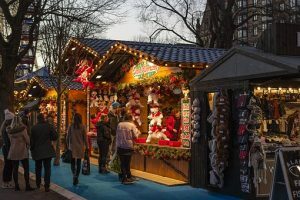 Inject some real Christmas spirit into your shopping with a whirl around one of these seasonal markets. With time to spare before Christmas Day, there’ll be no last-minute fighting the crowds or praying that your online shopping arrives in time. Get in the mood for Father Christmas’ arrival over the first weekend in December. The 9th annual Deepdale Christmas Market is happening on Friday 1st, Saturday 2nd and Sunday 3rd December, with over 120 local artisans and producers gathering on the North Norfolk coast to present their wares. Expect tasty treats, decorations, soaps, homewares, photography, jewellery and much more within the three large marquees. Plus, there will be lots of foodie stalls to refuel, so you won’t go hungry! Sandringham’s popular Christmas craft show is back from Friday 17th to Sunday 19th November, bringing the chance to shop in comfort for all your festive food and gifts. Be met at the gate with a warming glass of seasonal punch and take a stroll around the craft halls for inspiration. With live music, craft demos and children’s entertainment, it’s a great day-out for all the family. Father Christmas himself will be making an appearance with his amazing owls and reindeer, and don’t miss the chance to see the chainsaw-carving elves! Creake Abbey’s popular farmers’ market takes place on the first Saturday of the month, with a special Christmas market on Saturday 23rd December, ensuring essential shopping trip for all your dinner table treats and festive goodies. Around 55 of the region’s best food and drink producers will be in attendance, supplying meat, fruit, vegetables, cakes, tarts, artisan beer, apple juice, breads, puddings, pies, and much more. Where else to celebrate the spirit of the season than the royal family’s traditional Christmas residence? Sandringham Visitor Centre will be hosting its fantastic farmers’ market on the last Sunday of the month in the lead up to Noel, with a pre-Christmas December market on Sunday 17th. Pick up your locally-sourced delights, from scrumptious cakes to homemade jams, and why not pay a visit to the on-site gift shop for unique stocking fillers galore? 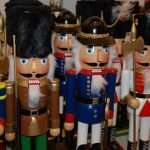 This entry was posted in What to do/Where to go and tagged Christmas, craft, Creake Abbey, Day out, Deepdale, Event, Food, Gifts, Market, Norfolk on September 26, 2017 by Lili Skerritt. Country Living – What’s Not To Love? Norfolk is one of the most rural counties in England, with over 90% of its landscape given over to farming. A rich tapestry of fields, open countryside and quaint villages, it still retains much of its former glory, which is perhaps why so many visitors choose to come here to escape the hustle and bustle of the busy towns and cities. Country living offers a much more relaxed way of life, with a rich variety of wildlife at your fingertips, beautiful views to admire, as well as a real sense of old-fashioned community spirit. There is so much for visitors to do, whether it’s a trip to the coast, a woodland walk, or a visit to one of our spectacular stately homes, such as Sandringham House, the much-loved country estate of the royals. Norfolk’s picturesque villages are brimming with traditional flint cottages and period houses, as well as medieval round tower churches, for which the county is famous. Offering cleaner air, a slower pace, and all-round peace and quiet, being in the middle of nowhere definitely has its advantages! A 329-acre working farm, Snettisham Park gives visitors the opportunity to get involved in many exciting farming activities, from seeing lambs being born, to going on a spectacular 45-minute deer safari, where you will meet the magnificent red deer herd. Collect fresh farm eggs, enjoy a pony ride, or go on one of three wonderful farm trails. There is also the chance to unwind in the tea room or on the terrace, with views out over the cattle and sheep pastures. Well-behaved dogs on leads are welcome (excluding the deer safari). Taking you through fantastic scenery and landscape covering more than 90 miles, the famous Peddars Way and Norfolk Coast Path runs from Hunstanton and continues along the coast to Cromer, most of it passing through the Norfolk Coast Area of Outstanding Natural Beauty, a unique area of forest, heath and low river valleys. 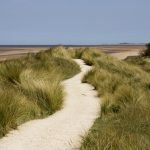 Walking along the gentle path treats all walkers to fabulous views of sandy beaches, endless skies, acres of Norfolk farmland and undulating countryside, while the thriving birdlife spotted along the way offers a birdwatcher’s paradise. This entry was posted in General News and tagged Country Living, Deer Safari, Norfolk, Norfolk coastal path, Peddars Way, Sandringham, snettisham park on September 15, 2017 by Lili Skerritt.